After many weeks of hitting various Michael's, I finally found the Elegant Edges Cricut cartridge! To make my card base, I took two of the "book" cuts (at 4.25"), flipped one, and welded them together with my Gypsy. I cut the layer at the same size, but trimmed about 3/8" off of it, so that my light green card base would show on the edges. The yummy cake is from Sweet Shop Cricut cartridge, cut at 3". Very cute Katie I love the elegant edges cart thanks for the new idea in using it. Have a great day. yea! you finally got it! but thanks, now I want it!lol! Pretty card!! Don't you just love Elegant Edges cart! 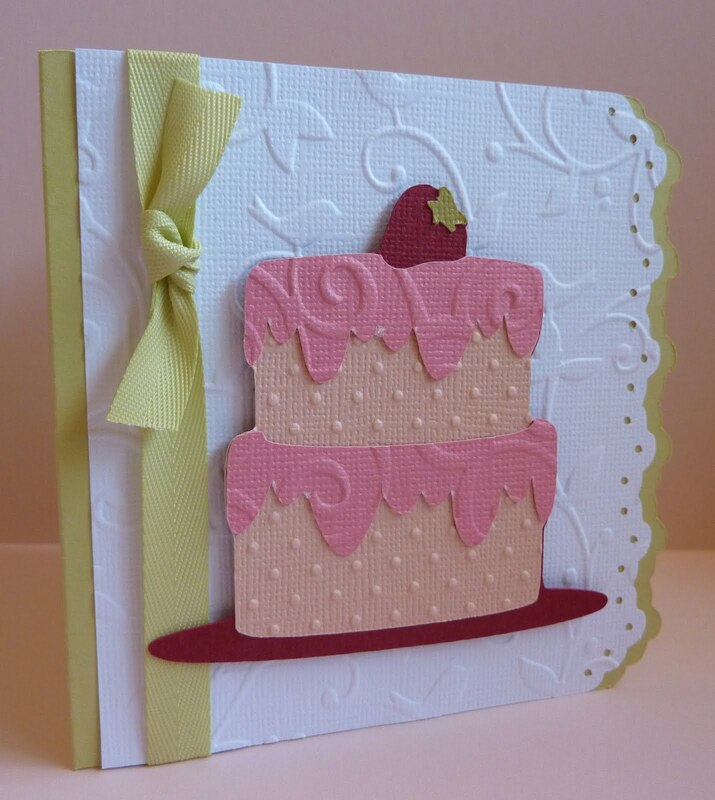 ?--pat N.
What a pretty card and might I say Yummy too:) Great job...love the embossing, adds a lot of interest to your card! Great job as always...I love your creations. I love your cards. Please come to my blog and pick up your award. Super cute! I love this cart! Wow!